Written by Sue Mackay on 23 April 2019 . I am at last in a position formally to reveal a project on which I have been working single-handedly for the last two years, as my contribution to the 1820 Settler Bicentennial. As my husband and I enjoy touring the country I rather rashly agreed to take as many photographs as I could of British Settler locations prior to 1820 so that they could be added to a new section on the eGGSA website. 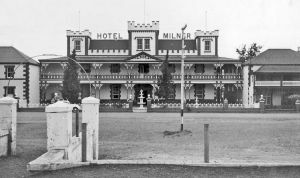 I have indeed taken hundreds of photographs, but it was soon borne in upon me that I couldn’t possibly visit every location, and also that in many cases, particularly in cities like London and Bristol, many buildings with settler ties simply no longer exist. 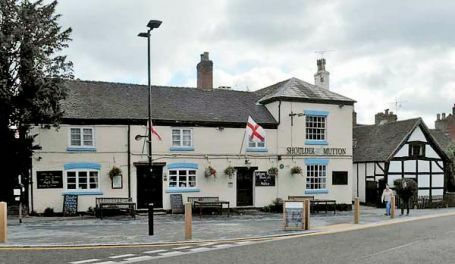 In the latter case I have tried to include historical pictures where possible, and where I have not been able to take pictures myself I have added pictures from www.geograph.co.uk, which can be used under a Creative Commons Licence. Where the photographer’s name appears as a clickable link followed by a CC BY-SA 2.0 reference, the original photo can be viewed together with other photographs of the surrounding area. I have uploaded over 1300 photos to the new site (with thanks to Richard Ball for his help and patience in setting it all up), and these are currently arranged by county for England, Scotland, Ireland and Wales, with separate sections for the cities of Birmingham, Bristol, Dublin, Edinburgh, Liverpool, London, Manchester and Nottingham. London has been further sub-divided into Boroughs so as not to have too many pictures in one file. The pictures appear as small icons with a brief title. Clicking on them will reveal a larger picture with text explaining the link to one or more settlers and a credit to the photographer. Clicking on the + sign will further enlarge the picture to full screen (use ESCape to exit full screen mode), and the photographs can all be downloaded from the site. During the bicentennial year I hope to upload a series of Photo Albums to the eGGSA Facebook pages in Party Groupings. In the meantime, if you wish to see if there are photos relating to your particular settler ancestor, go to https://www.eggsa.org/1820-settlers/ and type in the settler’s name in the Search Box in the top right hand corner, then scroll down the list of hits. Links to the relevant photographs should appear at the end of the list. It is also linked from the Photograph Collections button on the banner across the top of the site. This has been a one woman show, and so it would be amazing if I have managed to complete the project without typos or broken links. Please let me know if you find any, and if you can add any further UK photos to the collection which are not copyright then they will be gratefully received. Written by eGGSA on 04 March 2019 . 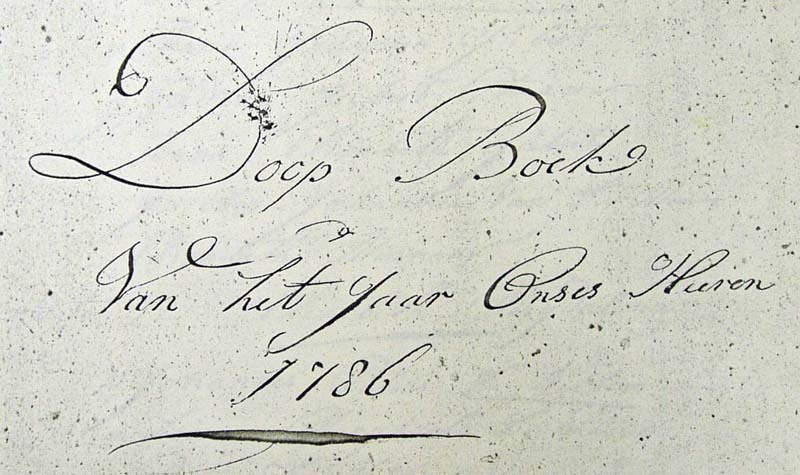 Data from the Drakenstein baptismal register from 1694 to 1744 is now available in the eGGSA BDM database. 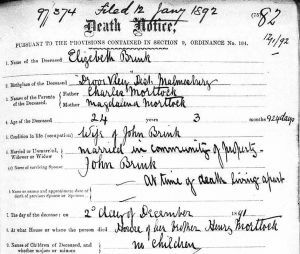 Lizette Svoboda has transcribed the section 1702 to 1732, Corney Keller the section 1733 to 1755 and Richard Ball the section 1694 to 1713. 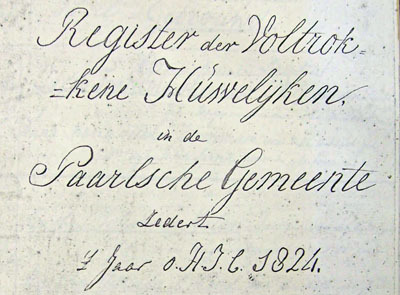 Cornel Viljoen has transcribed from 1756 to 1799 and provided the links to the LDS online copies of the original registers, G1 8/1, G3 3/1, G3 3/2, G3 3/3 and G3 3/4 which are housed and maintained by the NGK Argief, Stellenbosch . 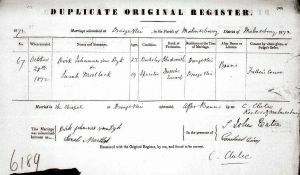 In order to access the LDS images you will need to be registered with FamilySearch.org. Written by Lunette Lourens, from eGGSA Facebook on 28 February 2019 . 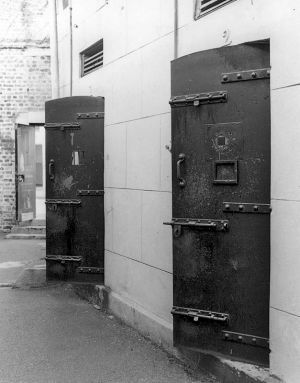 Photographs are important sources of information for researchers in all study fields, including genealogical research. We are all aware of the necessity of preserving documents, since archives have an important cultural value for the protection of our identity and collective memory. Photographic materials are therefore key sources for historical research, especially for the study of the nineteenth and twentieth centuries. The amount of information and detail that can be seen in photographs is what makes them a uniquely rich historical resource. They can show exactly how a person, place, item, building, clothing, etc. looked at a specific time. Therefore, photographs should not be considered as purely supplementary material but instead as illustrative “windows to our past”. 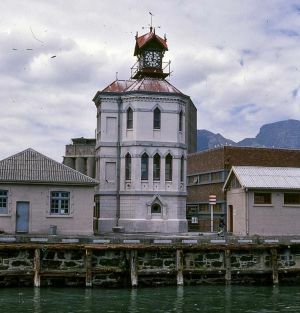 At present the Western Cape Archives and Records Service (WCARS) has about 90 000 photographs in the various collections in stock. The photographic section also houses the negatives of most of these photographs. The descriptions of most of the photographs, negatives and colour slides are already available on the internet databases. The photographs that accompany this article were chosen from the collections due to the buildings shown being subsequently demolished, replaced, restored, neglected, deserted or changed as a result of development. 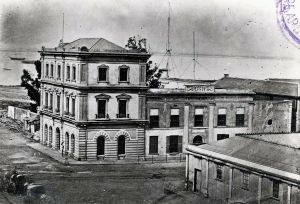 Therefore, although the buildings are not there anymore, the images are proof of their history. 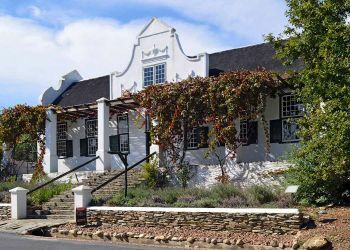 Written by Keith Meintjes on 31 January 2019 . 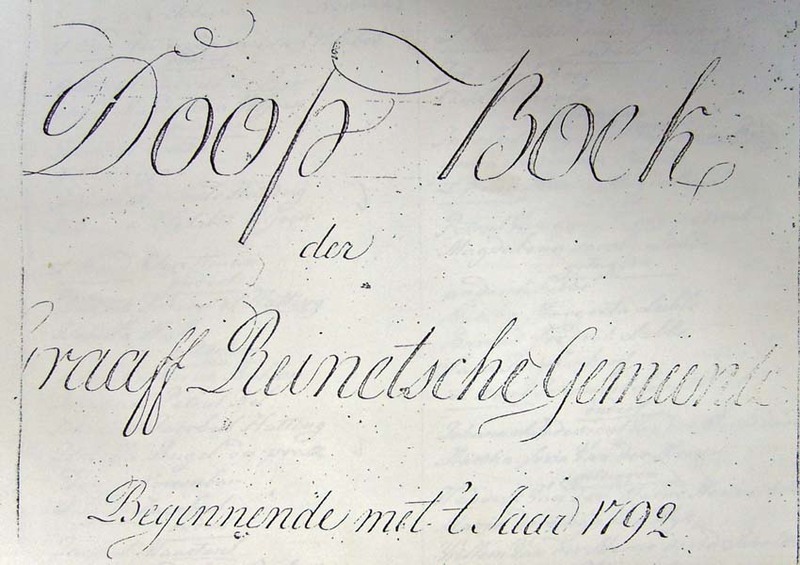 Keith Meintjes writes: When I visited the Nederduits Gereformeerde Kerk Archive at Stellenbosch in 2016, Isabel Murray gave me a tour of all the stuff in their basement. 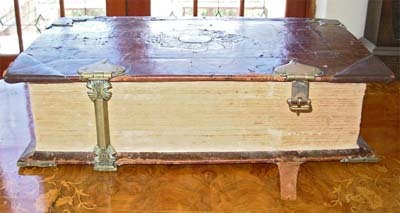 They have all manner of things in addition to the church registers - 370 years of church history. One thing that caught my eye was a pile of Bibles since many people wrote their family information in their Bibles. Isabel told me they had many Bibles, all uncatalogued, that no one had ever looked at. So, we cooked up a project. Isabel found a student, and I bought them a camera, lenses and a tripod, and paid for the student's time to catalog and photograph the Bibles. The outside, the title pages, and any handwritten notes or newspaper clippings. I supported the student's time, and he spent his senior year doing the work. Towards the end, he was being interviewed on TV and radio about the importance of preserving the archives and family history. 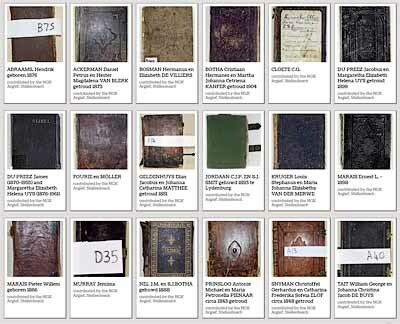 He photographed and catalogued 375 Bibles, of which 58 had inscriptions of some sort. Of those 19 had family information and those 19 have been added to the eGGSA Bible Collection, with grateful thanks to Keith for his project and enthusiasm, to Isabel Murray and Andrew Kok and to the anonymous student who did the work. Written by Richard Ball on 17 September 2018 . We have had a great many contributions of Bible photographs in recent months - here are those that have been added to our Bible Collection this month. We offer grateful thanks to the generous contributors: Billy Baard, Willie Breet, Ockert Malan, Riana le Roux, Leslie Duckworth, Alice Boshoff, Joost Hogewoning, Sam Basch and Hennie Nel. Written by eGGSA on 15 July 2018 . 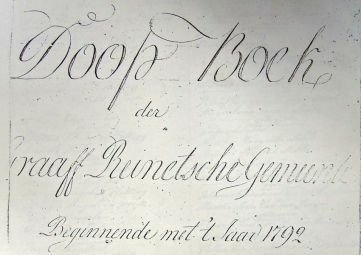 (up to 1795) and (1795-2011) which are among eGGSA's selection of articles. Written by Sue Mackay on 06 July 2018 . Written by Sue Mackay on 12 March 2018 . 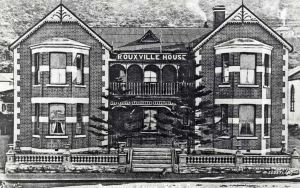 Publishing of extracts from the Grahamstown Jounal continues. I have started to publish them monthly rather than quarterly, as there are more issues of the paper to go through. I only need to transcribe a few more pages and my Word file of GTJ transcriptions will have reached 1,000 pages! 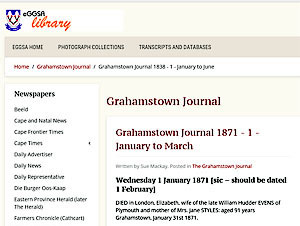 See the extracts from the Grahamstown Journal, now up to December 1882, on the Newspaper Extracts section of the eGGSA web site. Written by eGGSA on 06 March 2018 . 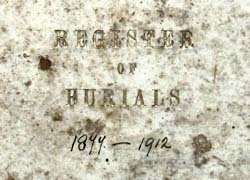 Gravestones now have a website to themselves! 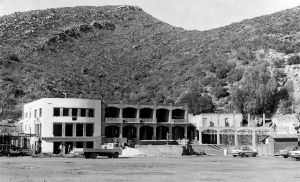 Written by Richard Ball on 04 March 2018 .
so all that needs doing is to replace the eggsa.org/library in the old link with graves-at-eggsa.org to form the new link. Written by Sean Fraser for eGGSA's facebook page on 24 February 2018 . 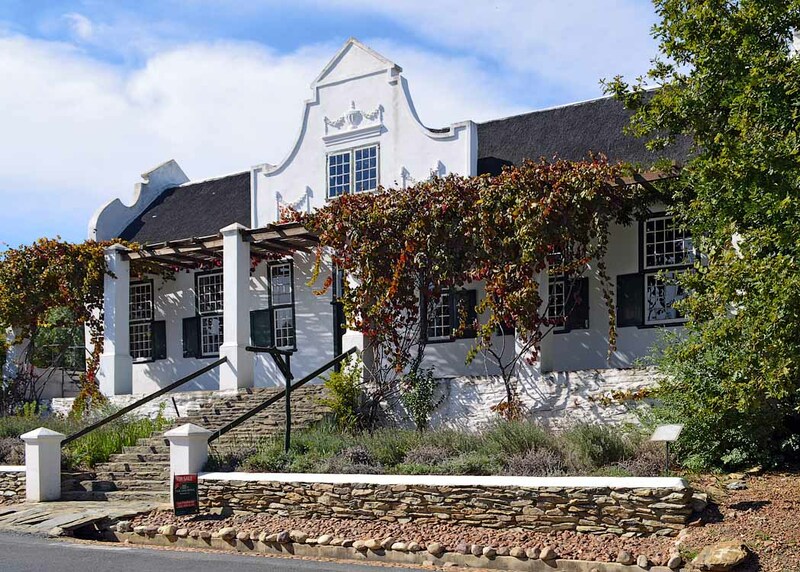 Along the dry and dusty road between Cape Town and Malmesbury lies a stretch of the Swartland known – certainly in the 1800s – as Groote Drooge Vlei (or, alternatively, Droge Vallei). 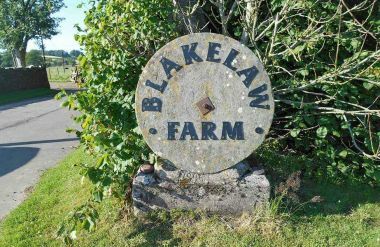 It’s an area I stumbled across searching for the origins of my great-great-grandparents, and one whose history remains elusive. 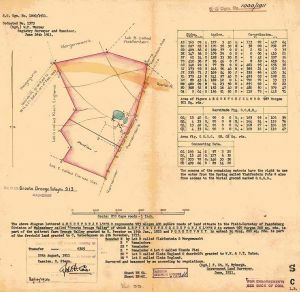 What we know, it seems, is that it fell within the field-cornetcy of Paardeberg in the District of Malmesbury, part of the quitrent farm having been granted to a C Esterhuysen in 1715 and another to W Proctor on 15 January 1822. 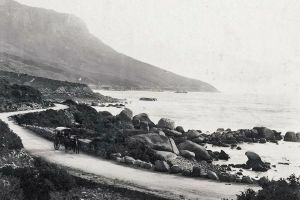 Significantly for my own personal research, the section known as Doordrift was granted to Misters WH and JT Eaton on 4 February 1862, as it is this section that came to be known simply as Drooge Vlei. Written by Alta Griffiths on 24 January 2018 . Our virtual AGM closed at midnight 28 February 2018. Thank you to all those members who responded to our notice regarding the Annual General Meeting and the support we received for the nominations. Members were invited to participate in the meeting; and as mentioned in the email dated 22 January 2018, we accepted that members from whom we did not hear were satisfied with the management nominations and 2017 Annual report. Members who selected eGSSA as their primary branch were entitled to participate in the AGM. Our email package keeps track of the number of emails delivered, returned, forwarded and unread and as the virtual branch we use these figures to determine our quorum. To the team, congratulations! Thank you for making yourself available for another year on the committee. Written by eGGSA on 12 July 2017 . 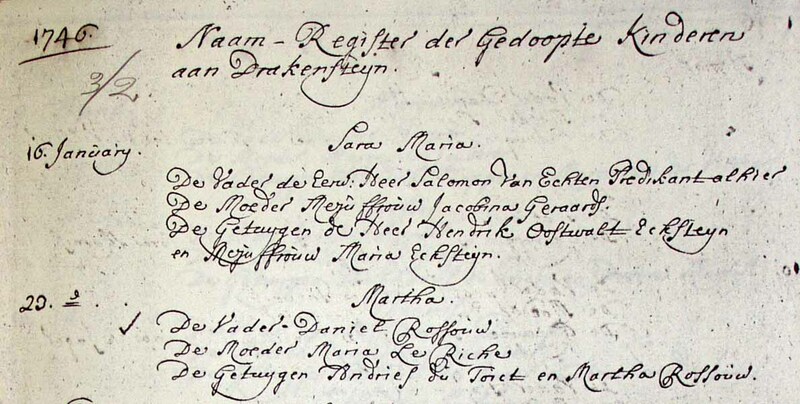 Corney Keller continues his magnificent series of transcriptions of the Cape Town Dutch Reformed (Nederduits Gereformeerde Kerk) records - the marriage records are now available up to 1770. 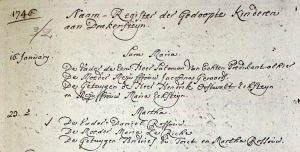 His transcripts of these marriages (1696 to 1770) have also been adapted for the eGGSA BDM database and can be searched there. Written by Alta Griffiths on 04 February 2017 . Our virtual AGM closed at midnight 2 February 2017. Thank you to all those members who responded to our notice regarding the eGSSA’s Annual General Meeting and the support we received for the nominations. Members were invited to participate in the meeting; and as mentioned in the email dated 27 January 2017, we accepted that members from whom we did not hear were satisfied with the management nominations and 2016 Annual report. Written by RwB on 10 December 2016 . Written by RwB on 24 October 2016 . 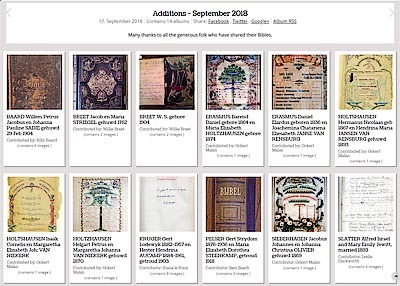 Photographs of four Bibles have been added to the eGGSA Collection: BOTMA Abraham Carel, Cornelis Zoon en Anna Sophia Magareta MALAN, David Dochter getroud 3 Jul 1854; KRUGER Gert Lodewyk 1882-1957 en sy vrou Hester Hendrina AUCAMP 1884-1961; REDELINGHUIJS George Frederik en Helena Johanna LEROUX, getroud 11 November 1895; VAN HEERDEN Isaac Petrus Jacs.Sts.Zoon en Geertruida Maria AURET, getroud 1 Maart 1836; VAN WIJK Petrus Lodewikis Julie 30 1876. Our thanks to Allan Carson, Dirk van Heerden, Riana le Roux and Adriaan Redelinghuys. Written by RwB on 20 September 2016 . 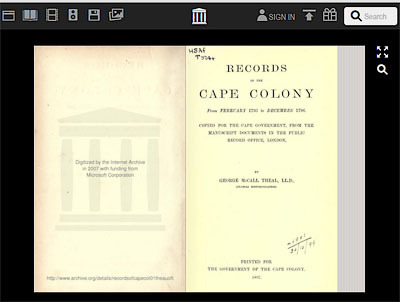 In the late 1890s and early 1900s George McCall Theal published 35 volumes of "Records of the Cape Colony", covering Colonial Office correspondence from 1793 to 1827 held at what was then the Public Record Office (now the National Archives) in London. Sue Mackay has checked each of the online copies of these volumes and provided links to them on the eGGSA web site. Written by RwB on 24 July 2016 . Written by RwB on 15 July 2016 . Written by RwB on 17 June 2016 . 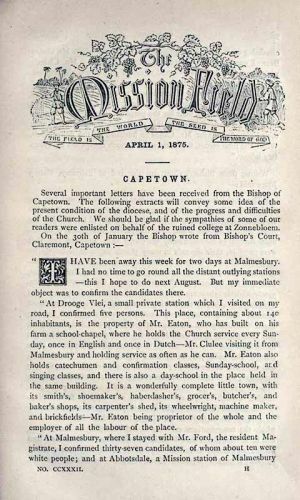 Sue Mackay writes: I have finally been able to photograph the next couple of years, from 1871 onwards, of the Grahamstown Journal at the British Library in London. The first batch can be seen among the eGGSA Newspaper Extracts. 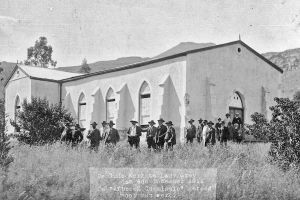 This batch is considerably longer than usual, not only because there are a few lengthy obituaries but because I got seduced by a series of articles on Life at the Diggings, describing the burgeoning businesses at the diamond fields. Written by Corney Keller on 06 June 2016 . Written by RwB on 22 May 2016 . 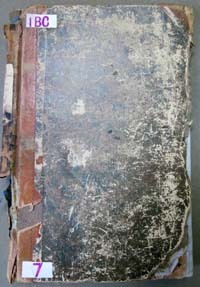 Cornel Viljoen has kindly contributed his transcription of the so-called Voortrekker Baptisms, a photocopy in the Pretoria Archives, FK 2290, of an earlier transcription by hands unknown, of baptisms from 1837 to 1850 found in a number of early church registers from Natal, the Free State and the old Transvaal. Written by RwB on 28 April 2016 . 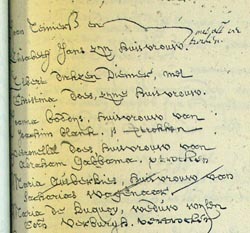 The baptism register of the Uniondale Nederduits Gereformeerde Kerk (NGK) 1866 to 1920, has been transcribed by Carol Beneke from photographs of the original register taken by Mechelle Beneke at the Church, by agreement with the minister. 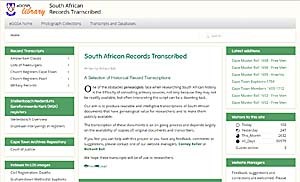 These records have been added to the eGGSA BDM database and are now available to searchers. Any queries or corrections can be addressed to Richard Ball. Written by RwB on 25 February 2016 . Londonderry Standard - Thursday 01 April 1858 - Emigration to the Cape. On Saturday, the magnificent 'Black Ball' ship Gipsy Bride, sailed for the Cape of Good Hope, with 500 emigrants, selected by the Hon. William Field, who has been deputed by the Cape Government to represent them in England. They were chosen almost entirely from the pastoral districts of Scotland, and a finer set of people have rarely left our shores. The Aurifera has been chartered for the conveyance of emigrants to Algoa Bay, and she will leave the Mersey on the 22d of April. Liverpool Albion. Montrose, Arbroath and Brechin review; and Forfar and Kincardineshire advertiser. 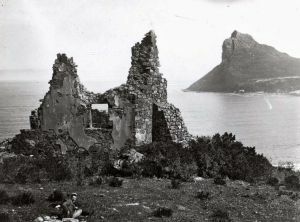 - Friday 09 July 1858 - Cape of Good Hope. Dr Livingstone's expedition sailed from Table Bay on the 27th Apr8l, for the Zambesi. An elegant silver box, containing 800 guineas, had been presented to Dr Livingstone, as a testimonial, by the colonists. 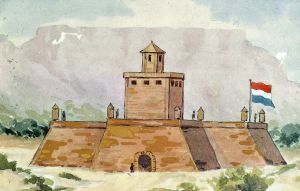 A proposal was made by the Governeor to establish five intermediate posts between the colony and the Zambesi, to ensure a line of monthly communication. A fierce struggle continues on the frontier between the Bisutos and the Orange Free State. 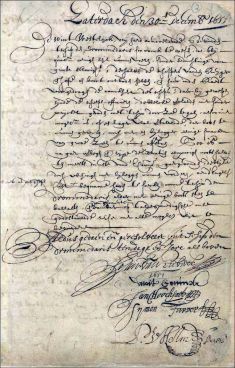 Sir G.Grey consented to act as mediator. Two Basuto towns and four French mission stations were destroyed. The colony was peaceful and prosperous. The first batch of emigrants has arrived in the Gipsy Bride and gave great satisfaction. Reynolds's Newspaper - Sunday 11 September 1859 - Emigration to the Cape of Good Hope. 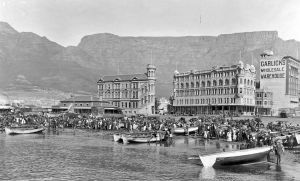 The Cape Town Immigration Board at their last meeting, a few days before the departure of the mail, resolved to forward the following communication to the Emigration Commissioner in England. 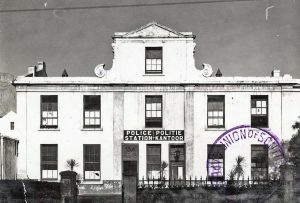 Immigration Office, Cape Town, July 30, 1859. The Honorable W.Field Esq., Emigration Commissioner, London. 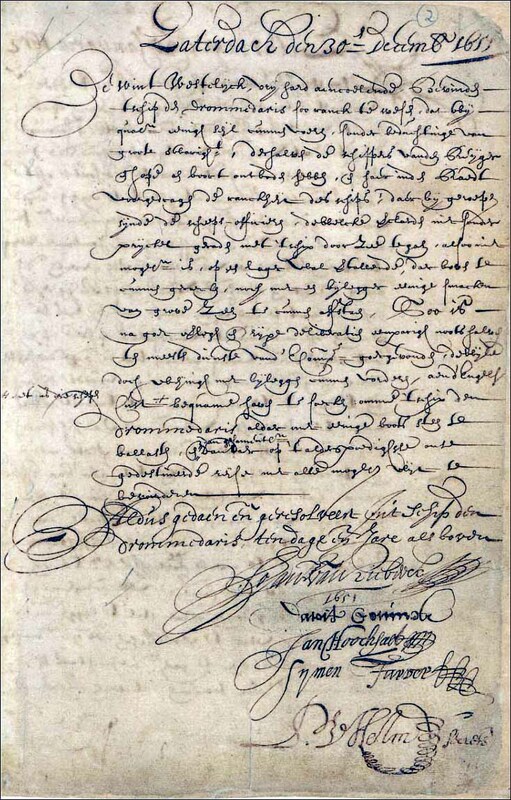 Sir, I have the honour to acknowledge the receipt of three letter from you of the 6th ultimo, acquainting me, for the information of the Immigration Board, of the departure of the Burlington with emigrants on the 30th May, and of your having chartered the Lord Raglan to convey emigrants to Table Bay, which were to embark on the 16th instant. The board instructs me to inform you that the immigrants per Bride have all taken employment, and with the exception of a few, have quitted the depot - those remaining being the parents of children suffering from measles. 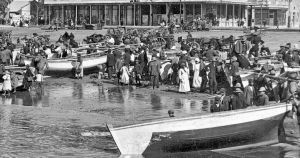 Several remained also for some days owing to the unfavourable state of the weather, and the difficulty existing at the present time in procuring conveyance for their removal to the interior. 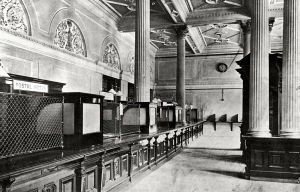 The wages obtained by most of them are quite equal to former rates, as will be seen by a list accompanying this. The board desires me to call your attention to the circumstance of one of the immigrants per Bride, named Simon Lucas, having died of consumption the day after his arrival, and would recommend a more strict inquiry into the health of emigrants generally, and that none be sent out but such as are and have been for some time in perfect health, and in the habit of working for wages. 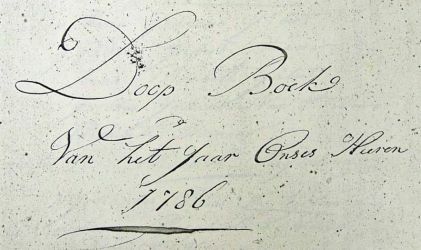 Lucas, according to the statement of the surgeon-superintendant, Dr Pearce, came on board in a very delicate and precarious state of health, showing evident symptoms of consumption; and it has come to the knowledge of the board that several sent out on former occasions, particularly of the Scotch per Gipsy Bride, were invalids in search of health, some of whom have died, and a few recovered. Lucas leaves a wife and six children, with the prospect of a seventh, all of whom continue at the depot at the expense of the Government. 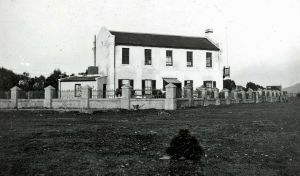 With regard to farm labourers, the board considers it most undesirable that such immigrants should be encumbered with large families, and particularly with any number of young children, such operation as a hindrance to their obtaining ready employment, the wages they receive are sometimes as inadequate to meet their expenses that they naturally feel dissatisfied, and become disheartened. The board deem sit necessary to remark upon the practice adopted in some cases by the immigrants themselves of describing a man incorrectly in regard to his trade or calling, in proof of which I herewith enclose a list of names of men who declared the were refused to be received under the head of their proper calling, but were allowed to enter themselves under some other head, in order to render themselves eligible. This false statement has given rise to considerable unpleasantness and disappointment in one or two cases; it misleads the public, and causes the immigrant who refuses employment to suffer. W.Hampson, Secretary. 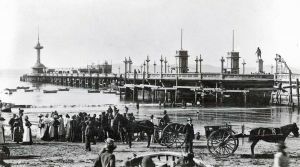 The following is the scale of wages at which engagements were made in Cape Town by the immigrants per Bride: - Farm labourers £2 to £2.10s with board and lodging, and 3s to 4s per day without ditto; railway labourers, 4s6d to 5s per day; stonemasons 6s6d per day; wheelwrights 6s; sawyers, piece-work, equal to 6s to 7s per day; [s]bines makers, 5s to 7s per day; tailors, piece-work, 4s to 5s per day; painters and glaziers, £3.10s per month and found, or piece-work; brickmakers, piece-work; dressmakers, £1.10s per month and found; female cooks, £1 to £2 per month and found. Written by RwB on 26 January 2016 . Four Bibles have been added to the eGGSA Bible/Family Register web site: COETSEE Abraham Petrus Carolus gebore 1876 & Wilemina Lodeweika LOMBARD gebore 1881 getroud 1898, contributed by Susan (Coetsee) de Bruyn; GEYSER, Johannes Jacobus Stephanus gebore 1801 & Magdalena Susina CALITZ gebore 1910 getroud 1827, contributed by Tracey Itta; RAFFERTY, Elsie Susarah Aletta Maria born 1853 contributed by Andrea Furness (nee de Jager); and TRUTER Johannes Andries gebore 1778 & Hilletje Aletta SMIT gebore 1778 getroud 1788 contributed by Matty van Rensburg. Our thanks to the generous contributors and to Basil Royston for captioning these. Any queries or corrections can be addressed to Richard Ball. Written by RwB on 21 January 2016 . 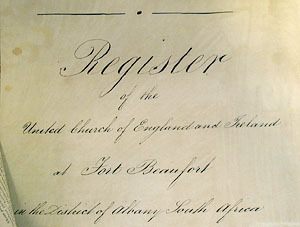 The burial register of Christchurch (Anglican), Grahamstown, 1877-1917, has been transcribed by Lorraine Beechey using William Jervois' photographs of the original register in the Cory Library, Rhodes University, Grahamstown, MS 17 633, by agreement with the Cory Library and the Archdiocese of Grahamstown. Brenda Gassner did the proof reading.